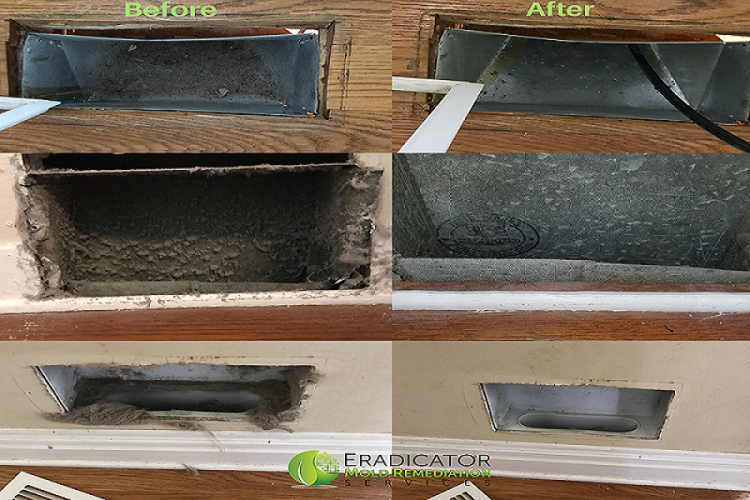 Eradicator prides itself in providing thorough mold inspections that assist in determining the existence of abnormal levels of mold activity. 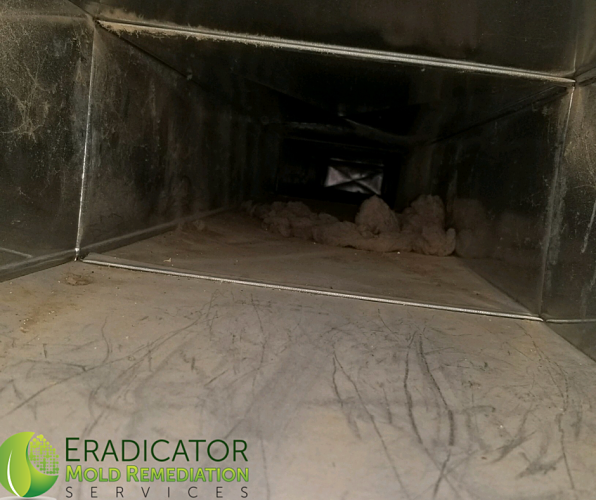 Through mold testing we are able to confirm scientifically the presence and levels of harmful mold yet often overlooked is the need to clean and sanitize the air ducts within the property as well as the supply and return vents. Air ducts are used throughout homes and businesses to deliver ventilation, air condition, and heat to a property. This is necessary to provide quality air flow (filtered air provided from return vents and redistributed through supply vents) as well as comfortability to the occupants of the property. As forced air is being circulated throughout the environment over time the duct system can become clogged with dust mites, pollen, hairs from pets, and even mold spores (if not maintained) that are able to bond with these dust particles. This then becomes the tainted air you and your family are breathing that may contribute to sick home syndrome as well as a loss on value of your property. In addition, people who may be exposed to indoor air pollutants for the longest periods of time are often those most susceptible to the effects of indoor air pollution. Such groups include the young, the elderly and the chronically ill, especially those suffering from respiratory or cardiovascular disease. Often when purchasing a home the prior owner may not have had the HVAC unit/s consistently serviced. This may require cooling coils to be attended to, air ducts and vents throughout the home cleaned and sanitized, and if you are unaware if these services were performed then you are less likely to be aware of the contaminants within the air that you are being exposed too. Also, it is normally recommended that filters within these systems should be changed every six months to a year and even more often if they appear clogged with dirt. These maintenance steps are necessary to ensure proper airflow within the HVAC unit, ensure reliable performance, and reduce annual energy costs. If you are feeling symptoms consistent with abnormal mold activity when you are within the home contact us to provide your property with a thorough evaluation. We will assist by helping to determine what is needed to restore your property to normal levels of air quality and with the use of our air duct cleaning system (that provides over 2500 cfm with a 3-stage filter design) we will.